If you have a hot tub in your yard, then you have a relaxing place to retire to when you need it. Having a hot tub can be a wonderful luxury, but a hot tub is also something which you need to take care of, and the area around it should be safe. Most hot tub accidents revolve around getting in and out of the pool. With the addition of water, hot tubs can become slippery places to be. You do not want to slip, and you do not want to overextend yourself as you are getting in and out. The best hot tub steps will make your hot tub a safer place to be. Most hot tub steps offer non-slip tread, enough height to safely enter and exit the pool, and some even offer storage. We have copied everything you need to know about hot tub steps, and our top 8 list will have a set of steps for you. Here are our top 8 hot tub steps in 2019. These steps may be small, but they will hold up to 350 pounds of weight. They are also great for using around the hose or garage, to reach the hard to reach spots. When they are beside your hot tub, the steps are designed to stay in place without marking up your floor. 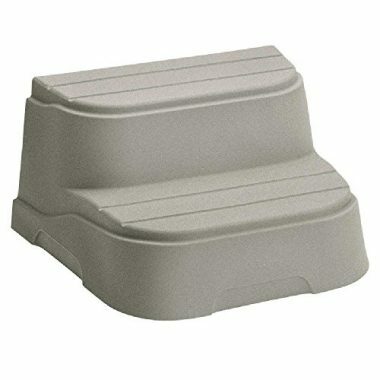 The molded plastic offers some slip-resistance, and the muted color will match any hot tub design. When it does come time to clean your steps, you can use some soapy water and wipe the steps with a cloth. 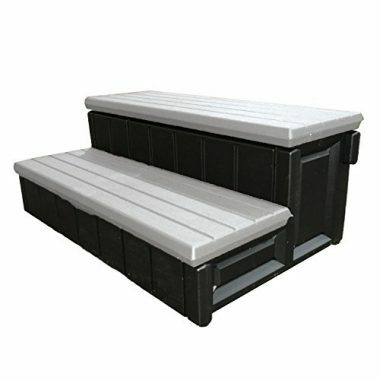 You can fill the sides with sand or gravel to weight them down when they are up against your hot tub or swimming pool. The weight will make them sturdy and will stop them from moving when you are getting in and out of the water. They also feature adjustable base pads and deck mounting brackets. The molded steps are extremely strong. They are also resistant to water damage and chemicals. They will hold up to 400 pounds. 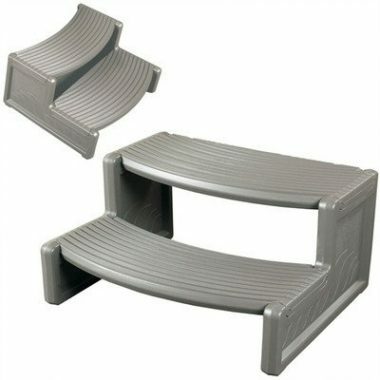 This 2-step molded step will hold up to 300 pounds. The steps are great for getting a little more height when getting into your hot tub. 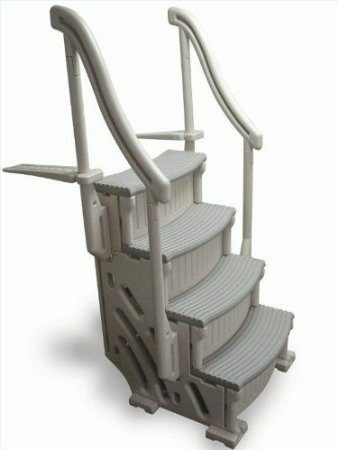 The stairs are comfortable to stand on and have non-slip rubber on the molded plastic. The great thing about the steps is that they can also be used around the house to get to hard to reach places. The feet will not mark up your floor, and the steps are small enough to store. These steps look great, and will elevate any hot tub area. 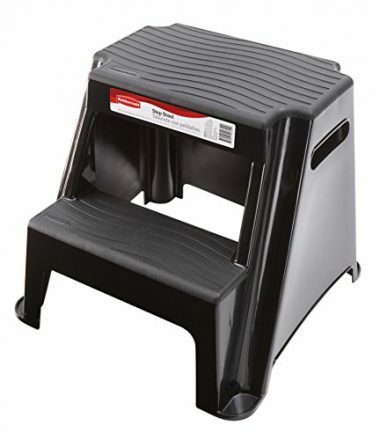 The steps are extremely sturdy and easy to take care of. You can see the quality in the steps by looking at them, but you will feel the quality too when you stand on them. These steps will resists any weather conditions, and the UV-resistance means that the sun’s rays will not change the color of the steps or make the material weaker. The steps are solid enough to not need tethered to the hot tub when they are in place. Once you have these steps in place, you can weigh the unit down with sand to keep it in place. This stops the stairs from slipping, and you will be protected from slipping with the anti-slip material and handle. You can use these steps for your pool or hot tub, getting in and out of both safely and easily. These stairs are among the most sturdy and strong on the market. They will hold up to 500 pounds, which is more than most hot tub steps out there. They give you great height when placed up against your pool or hot tub, and will make getting in and out a breeze. The best feature of this hot tub step is the included storage. You can flip open the top step, and you will find some generous storage underneath. The storage container within is 30 inches wide, 8 inches deep, and 12 inches tall. The storage container is also removable. This is great if you want to store some stuff away, and want to be able to move it from place to place. The steps can hold up to 300 pounds. The grey and redwood color options will give you a match for almost any hot tub or hot tub design. If anything does go wrong with the steps, the company offers a 1-year warranty. The red and beige adds a touch of color to your hot tub area, while still matching with almost any color scheme. The steps will accommodate up to 250 pounds and are built to last. The top step opens up to reveal a storage area, 36 inches by 12 inches by 9 inches. There is enough storage for all your hot tub accessories. These steps have been designed by Lifesmart to go with their Jewel, Hydromaster, and Grandmaster spas. The color will complement these hot tubs, but you can match these steps with other hot tubs. They are solid steps, and the slip-free tread makes them safe and easy to use. We love the rich mahogany color. When you are buying your hot tub steps, safety should be of the utmost importance. You are buying an accessory to help you get in and out of the water. 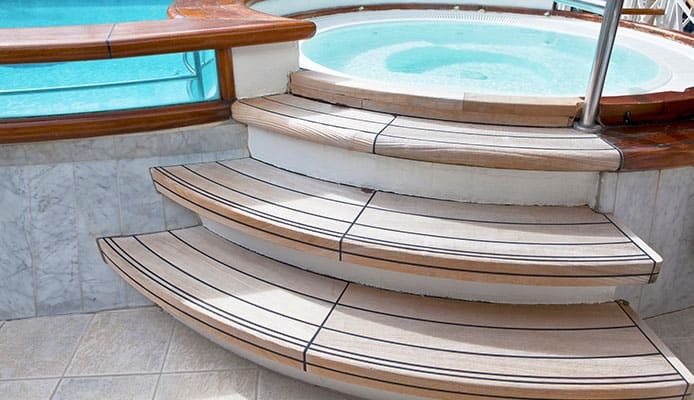 The most important attribute of your new hot tub steps is their anti-slip. Some hot tub steps will be better than others. Look for steps which have non-slip coatings which grip to your feet. Some molded steps will not be as anti-slip as others. Make sure to check the materials before you buy, and check out the ratings to make sure they offer protection against slipping when you are getting in and out of the pool. The other thing to think about when you are taking safety into account is the number of steps. You want to purchase steps which offer enough height to reach to the top, or near to the top, of the hot tub. If you only have a step or two, then you may as well have a stool to stand on. You should have enough steps to get you close to the top of the hot tub, and which allow you to step into the pool without too much effort. You have invested in your hot tub, and now you are buying steps for it. It can be tempting to buy a cheaper set of steps to save some money, but that can cost you money in the long run. You should be looking at the type of materials used in your hot tub steps, and making a decision based on how long they are going to last, and how they will last in your environment. If your steps are not going to last, then you may as well not buy them. By investing in a set of high-quality steps, you will not need to repair them soon after installing them, and you will not need to replace them for a long time. Installation is also something which you should think about. This is important to consider, though it should not put you off buying a specific set of steps. Of course, if the steps cannot be installed on your hot tub, then you should not buy them. You should not try and install incompatible steps on your hot tub, or you risk creating an unsafe environment. Some steps will take longer to install than others, and you may even want to get help with installation. You should also make sure that they are compatible with your hot tub cover. If you are buying a large set of steps or an expensive set, then it would not be unreasonable to expect some storage in the steps. A lot of high-quality steps will have internal storage. You may also be buying the steps for the storage. 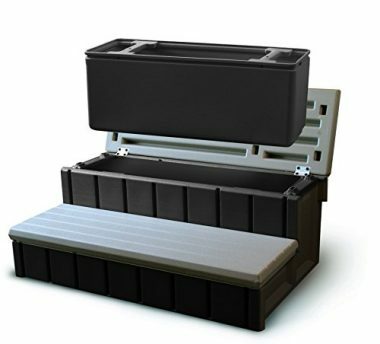 A large area of storage will give you the space to keep your accessories all in one place and will help you hot tub area to look tidier and uncluttered. 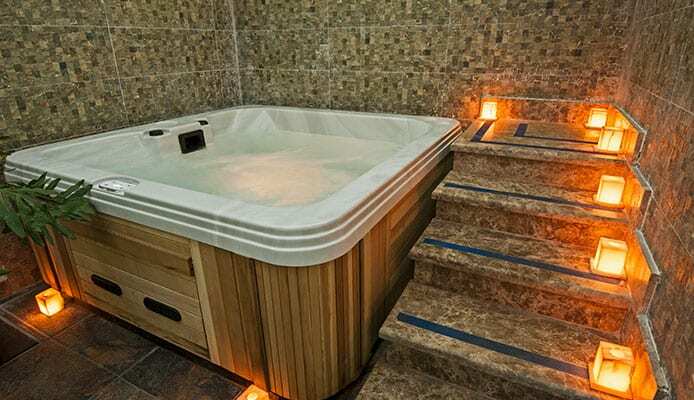 The design may not be the most important factor when you are deciding on which stairs to buy, but you will still want your hot tub steps to match your hot tub. For every hot tub, there are a set of stairs which will go with your tub. If you want the stairs to match exactly, then you can always order a custom set of steps for your hot tub. Q: What Are Hot Tub Steps? A: Hot Tub steps are exactly that; they are steps designed to perfectly fit with your hot tub. 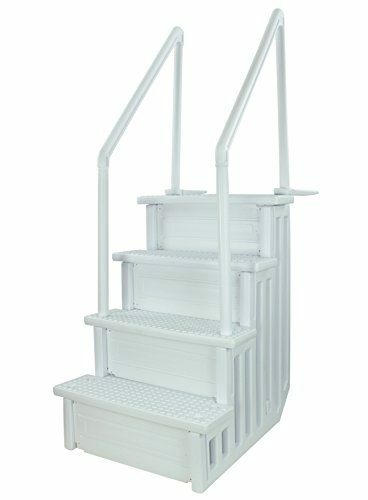 When you are getting in and out of your tub, a set of hot tub steps will make it easier and safer. You can find generic steps and custom steps. They come in all different sizes, with most of them being rounded for circular hot tubs. 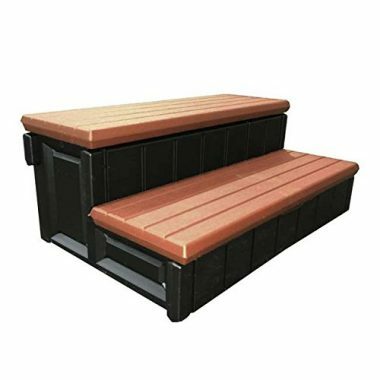 Hot tub steps will also come in a variety of styles and colors so you can match your hot tub. Q: Why Do I need Hot Tub Steps? A: Strictly speaking, you do not need hot tub steps, but that means that you will be stepping over the side of your hot tub and into the water. This can be extremely unsafe for even the most capable adult. Hot tub steps decrease the risk of slipping and falling. The surfaces around a hot tub are not designed to be slip-resistant. If you step onto the side of your hot tub when it is wet, there is a risk of you slipping. Hot tub steps are specifically designed to be slip-resistant. With so much water around your hot tub, it can become a dangerous area to step. Hot tub steps are great for safety. Hot tub steps also make it easier for you to get in and out of your hot tub. If you try to step over the edge of your hot tub, you can strain and injure yourself. With hot tub steps, you can get in and out of your pool easily and without any risk of injury. The steps are also designed to take the weight of an adult getting into your hot tub. The surround of your hot tub is not designed to be stepped on, and you run the risk of damaging your hot tub if you step on the side. If you do add steps to the side of your pool, you usually have some storage options added to your hot tub. Most steps will come with storage underneath, giving you a place to store any hot tub accessories, such as chlorine tablets and skimmers. Adding hot tub steps to your hot tub will make it a safer place to be. Hot tub steps will stop you from slipping when you are getting in and out of the pool. They will also stop you from falling or injuring yourself when you are getting in and out. You do not need to be stretching your leg over the side and stringing your muscles or finding yourself in weird situations. The best hot tub steps will make your life a lot easier. Our article has everything you need to know to make an informed choice.